The harvests were really down last week both because there is less in the garden to harvest and because I was taking a break from it. Dave and I took a few days off to go backpacking in Yosemite National Park, but not the usual part of the park, we headed to the less visited area around Hetch Hetchy in the northwest corner of the park. After leaving the popular hiking trail that runs along the reservoir we left the day hikers behind and ran into 3 other backpackers in the 3 days that we were out. We had Laurel lake all to ourselves the first night where were treated to an incredible serene sunrise. Our second night was at Lake Vernon where we enjoyed a beautiful sunset and total solitude once again. Not a person or a rat to be seen. Dave's biggest disappointment was that we didn't get to see any bears. Beautiful sunsets and sunrises are some of the experiences that I most enjoy about backpacking and that keep me hiking even in the rain. And we had plenty of rain, we hiked in in the rain and hiked out in the rain, but we did get one absolutely beautiful day which made it all worthwhile. One of the things that we enjoyed on this trip was my first effort at using dehydrated homegrown veggies in our meals. Dave declared the meals to be delicious and a resounding success (but then everything tastes great on the trail), but I had to agree that I was really pleased at how they came out. I had my dehydrator going nearly 24/7 the last couple of weeks preserving the tomatoes, peppers, and zucchini that were coming from the garden and those featured prominently in the meals. Added to the mix were onions from the garden, purchased mushrooms and shrimp, and a few other items. But more on that in another post. So on to the scanty harvests last week. I harvested the first bunch of leaves from the fall planting of Syrian Medieval Chard. We enjoyed this in a simple saute with minced onions and currants. It helped to satisfy my craving for some greens. I noticed that one of the melons in the garden had suddenly changed color and it slipped easily from the vine so perhaps it actually ripened. We haven't tasted it yet. And I found one largish tomato hanging in the vines. The few that are left on the vines now are green or barely starting to ripen. The Calabrese Broccoli plants produced a few more shoots. This bunch along with the small harvest from the week before were enough for a generous serving for the two of us. Syrian Medieval chard - 15 oz. Alvaro Charentais melon - 1.3 lb. 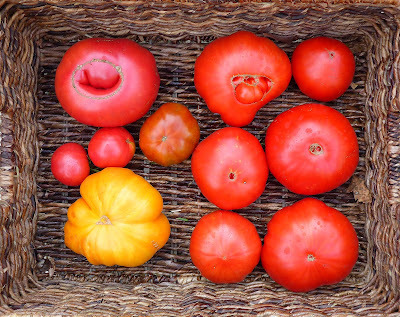 Pantano tomato - 3.9 oz. 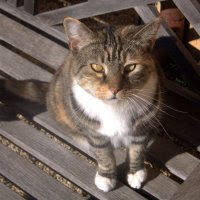 Now I've got to get out to the garden to see what rain and rats have wrought in the past 4 days. The harvests are on the verge of really slowing down now. 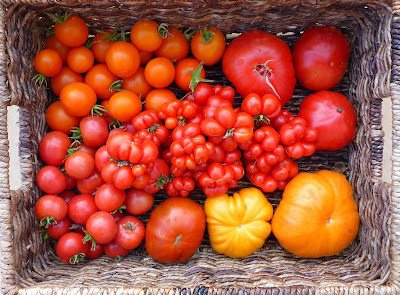 I gathered the final good sized flush of cherry tomatoes and just a few of the larger fruited tomatoes. There would have been more Camp Joy cherry tomatoes, but they have turned out to be the rats new favorite garden treat. 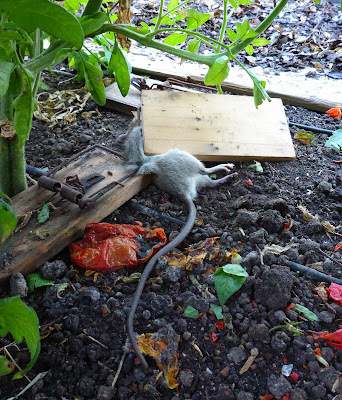 I'm hoping that the trio of rats that got snapped in the traps that I set in the tomato vines were the primary culprits and that there aren't too many more waiting in the brush for their chance to nab some tomatoey treats. 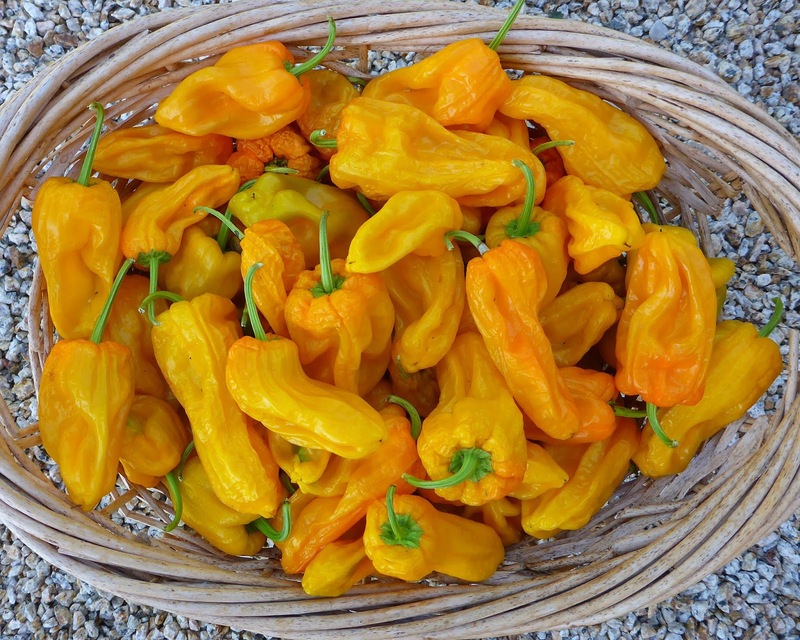 Some Mareko Fana peppers were ripe enough to harvest. My one plant isn't as large as either plant I grew last year so I won't be harvesting anywhere near as much. But I'm happy with what I'm getting because I thought I might get nothing this year because of the you-know-whos. The Gogosar peppers that I had hidden under a thick layer of Agribon fabric produced some very nice peppers, considering. And there were a few decent Yummy Belles peppers to be had when I cleared out the plants. 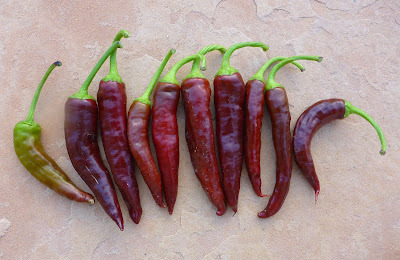 I pulled out the Petite Marseillais plants and got a lot of peppers, but most of them were already getting dry and wrinkled. The majority of them were cut into strips and dehydrated. 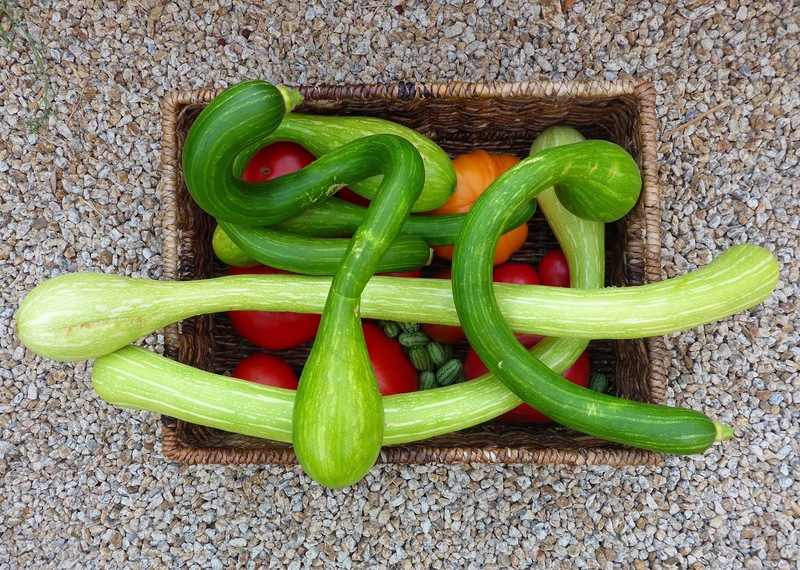 The Tromba d'Albenga vines popped one more squash. And I cut a few sprouts, a bit overgrown but still good, from the Calabrese broccoli plants. I have found that I actually prefer the sprouting broccoli when the heads loosen up a bit. That was it for the week. It won't be long before the harvests are dominated by leafy greens which I'm kinda craving now that the season has turned to shorter days and colder nights. I cut up one of the Discus Buttercup squash that I harvested a few weeks ago, one of the sunburned ones that was actually getting a bit moldy where the skin was damaged. It turned out to be very good, dense and a bit dry, not too sweet but not bland. I cut it in thin wedges, skin removed, and first sautéed the wedges in brown butter and then finished them in the oven. Served with a drizzle of balsamic vinegar, some grated parmesan, and sage leaves browned in butter. Dave and I loved it. And I used a pound of the Zuni tomatillos that I harvested the week before last to make a "Finger Salsa", following a recipe (mostly) from Gran Cocina Latina by Maricele E. Presilla. That also used up a few tomatoes, an onion from my stash, and some fresh cilantro from the garden. It was really good. Dave wanted to make sure that I could make it again. 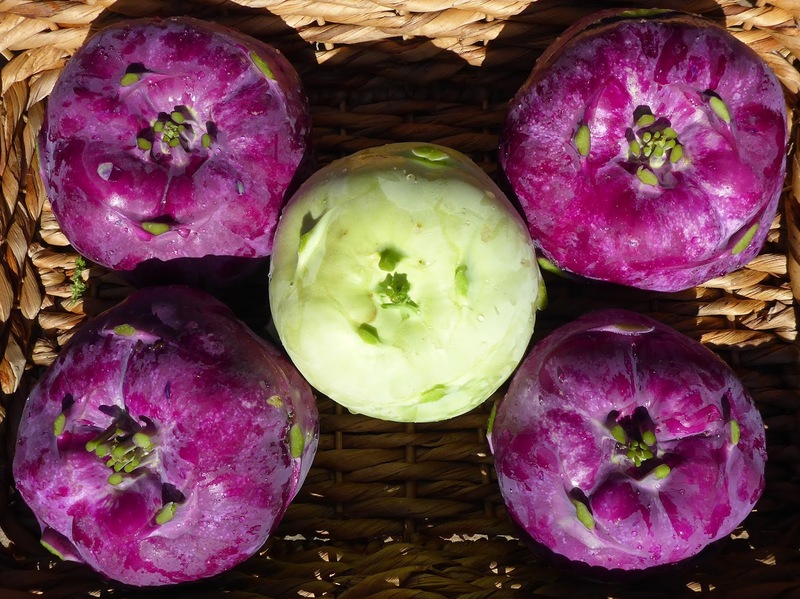 The rest of the tomatillos got roasted and frozen in portions for future use. 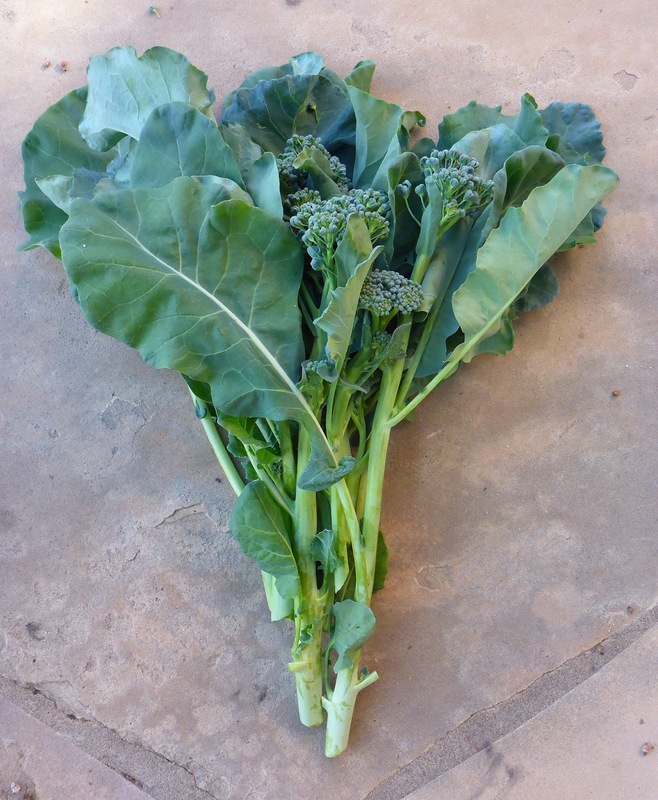 Calabrese broccoli - 10.4 oz. Gogosar peppers - 3.6 lb. 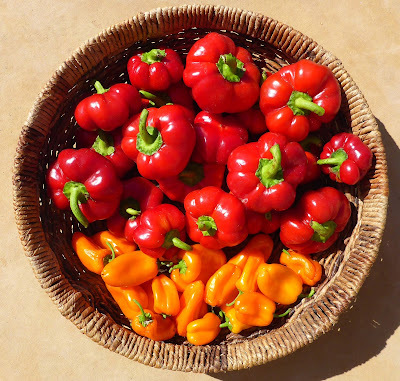 Mareko Fana peppers - 5.7 oz. Petite Marseillais peppers - 2.4 lb. Yummy Belles peppers - 10.6 oz. 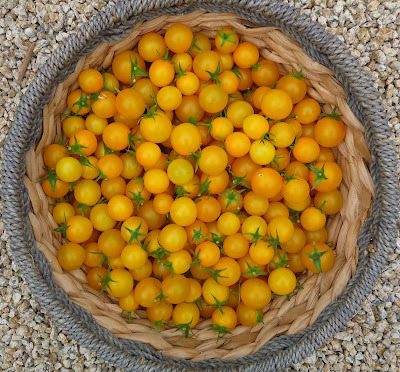 Camp Joy cherry tomatoes - 2.2 lb. 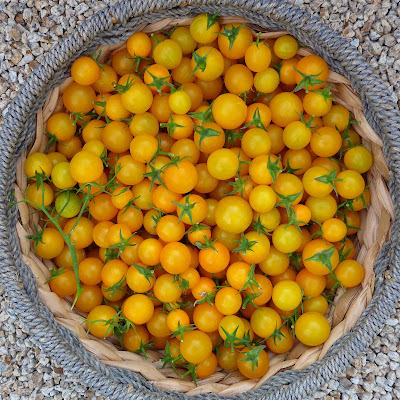 Jaune Flamme tomatoes - 1.4 lb. 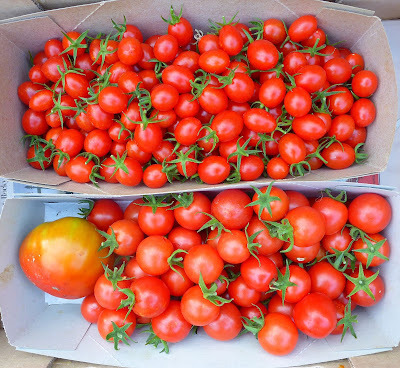 Mavritanskite tomatoes - 13.5 oz. 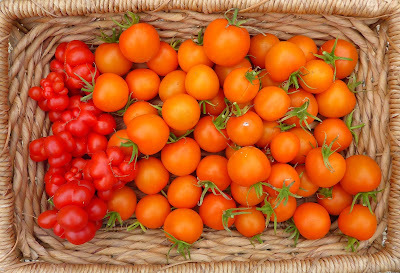 Orange Jazz tomatoes - 1.3 lb. 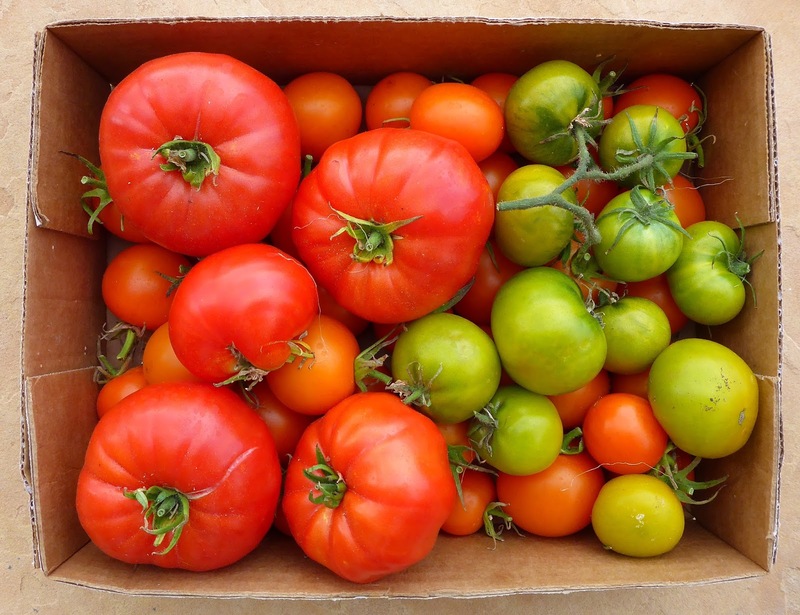 Pantano tomatoes - 1.2 lb. 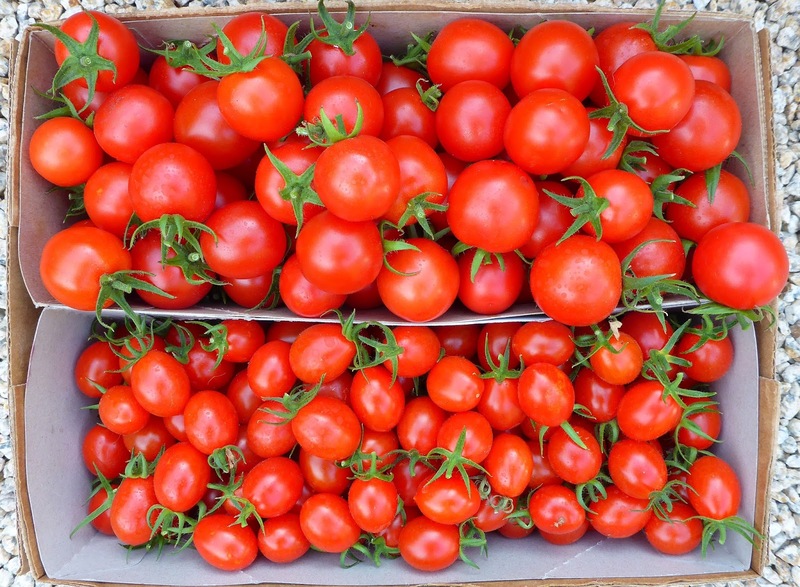 Piccolo Dattero cherry tomatoes - 2.5 lb. Pomme d'Amour tomatoes - 1.4 lb. Resietomate from Transylvania tomatoes - 1.6 lb. Sweet Gold cherry tomatoes - 4.5 lb. 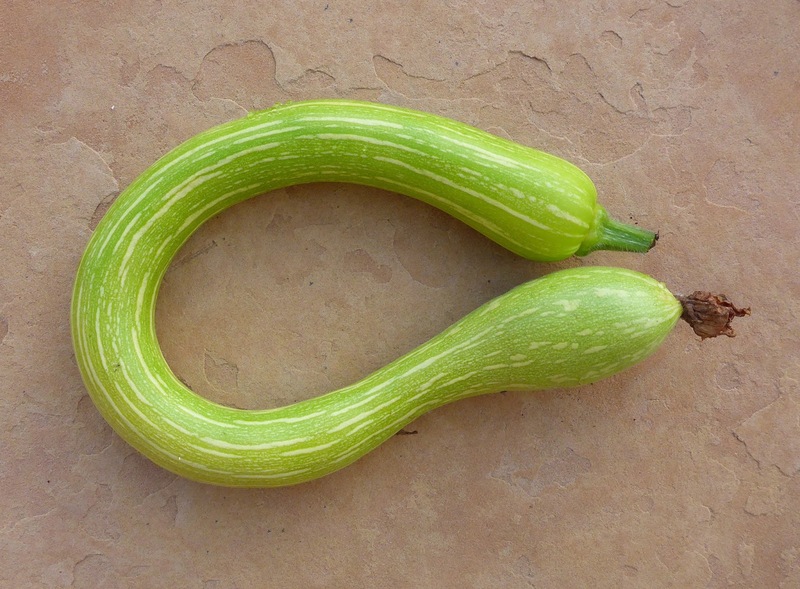 Tromba d'Albenga squash - 1.4 lb. Just a quickie update this week since I covered the garden fairly well last week and not a lot has changed since then. The biggest change is that I harvested most of the remaining peppers from the garden, cut down the plants, and sowed a row of Robin Hood fava beans in that space. This is a first for me, getting fava seeds sown before the end of October or even generally November. I usually cut down the pepper plants around the end of November when the peppers finally stop producing or the first frost hits. I left the roots of the peppers in the soil and then scattered my usual amendments over the surface and scratched them into the top few inches. 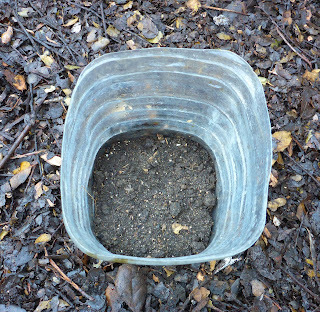 Then I sowed the fava seeds and put down a thick layer of composted oak trimmings over the surface of the soil as a mulch. I also sowed a row of Kodiak mustard on either side of the row of favas. If they survive the sowbugs and birds then I can cut them down and dig them in later. One of the biggest problems I have with growing favas is that the emerging seedlings get attacked by sow bugs (woodlice). There's always masses of sowbugs in my compost so I have to protect the seedlings from the bugs that I've introduced to the garden with the compost that I spread around. 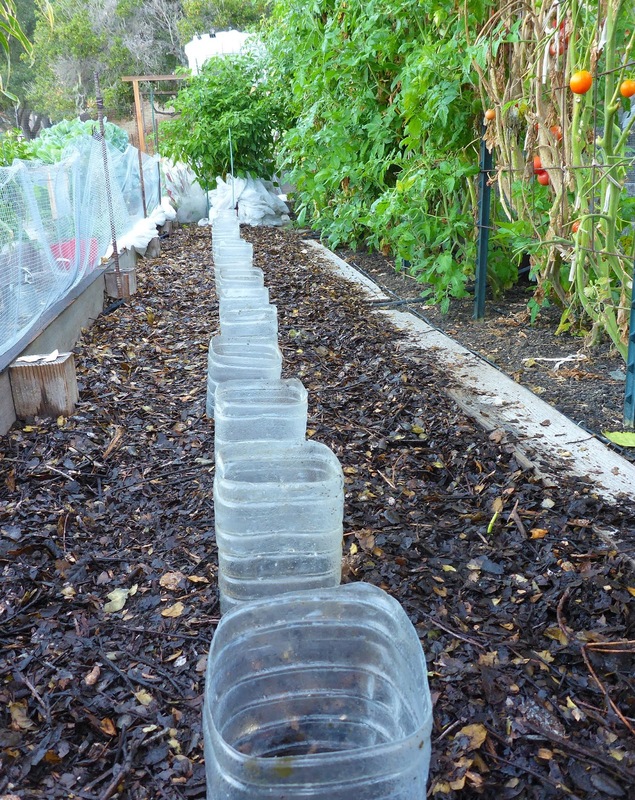 I've found that the sowbugs don't or can't crawl up plastic so I'm using protective sleeves made from old plastic water bottles to keep them out. Birds are also problematic so I hope the sleeves will discourage them from attacking. I mentioned before that the rats discovered how delicious my large fruited tomatoes are and now that most of those have been harvested the rats have moved on to the cherry tomatoes. 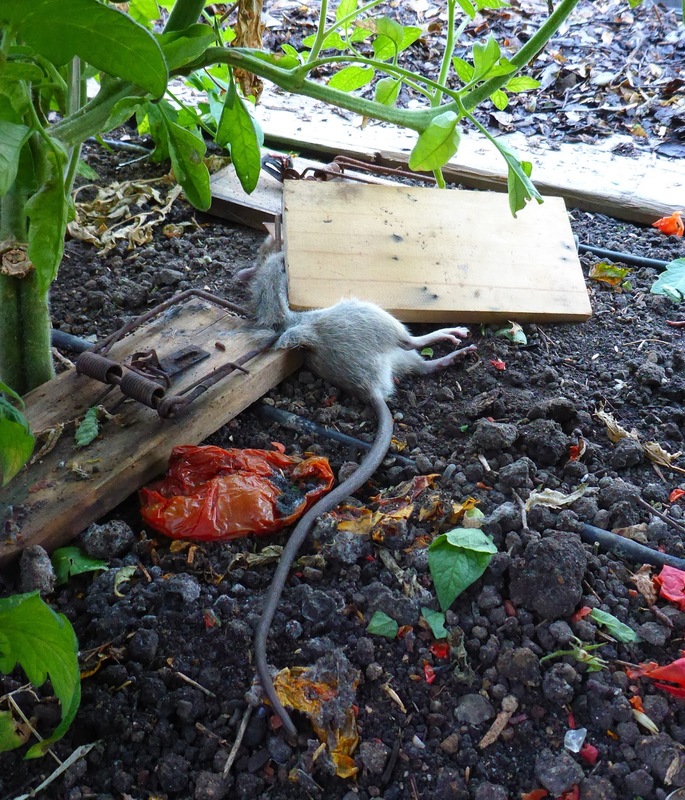 So I moved most of my vast collection of snap traps to the area beneath the cherry tomatoes and even perched a few traps up in the foliage. 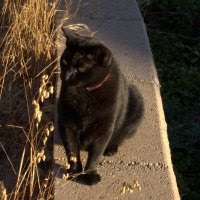 I don't even bother to bait the traps, the mice usually clean out the bait without setting off the traps. My strategy is to just make an obstacle course for the rats and hope that they step in the wrong place. Sometime that works. And so it goes for that tomato thief. It's not the first that I've caught this way. I may have to set a bunch of traps around my car. 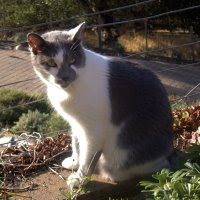 The damn critters just cost me a few hundred $$ to replace a hose line in the window washer system. You can see that it's still worth the effort to fight the Damn Rats. 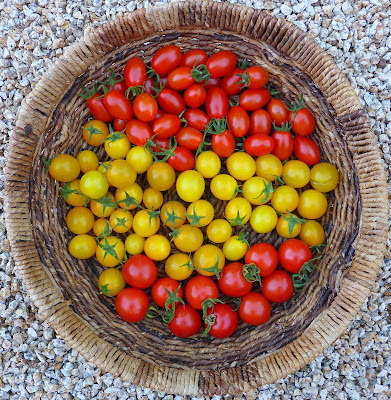 There's still lots of life and tomatoes left there. One of the Mareko Fana peppers was poking out of the swaddling cloth that I've place around the base of the plant and of course it got nibbled by a passing rat which didn't set off any of the traps that are set there. I hope the nibbler was the deceased tomato thief. But I'm sure there's still plenty of tomato thieves still out there. That's the space that used to be occupied by the powdery mildew infested tomatillos. Do you see the bungee cords that I had to use to secure the corn? There was just enough wind accompanying the rain that came through last weekend to make the corn start to lodge so I had to tie it up. I don't think I'll grow this corn again, it's just too tall for my little garden and it's taking too long to mature. But I think the I'itoi onions will be a regular in the garden. 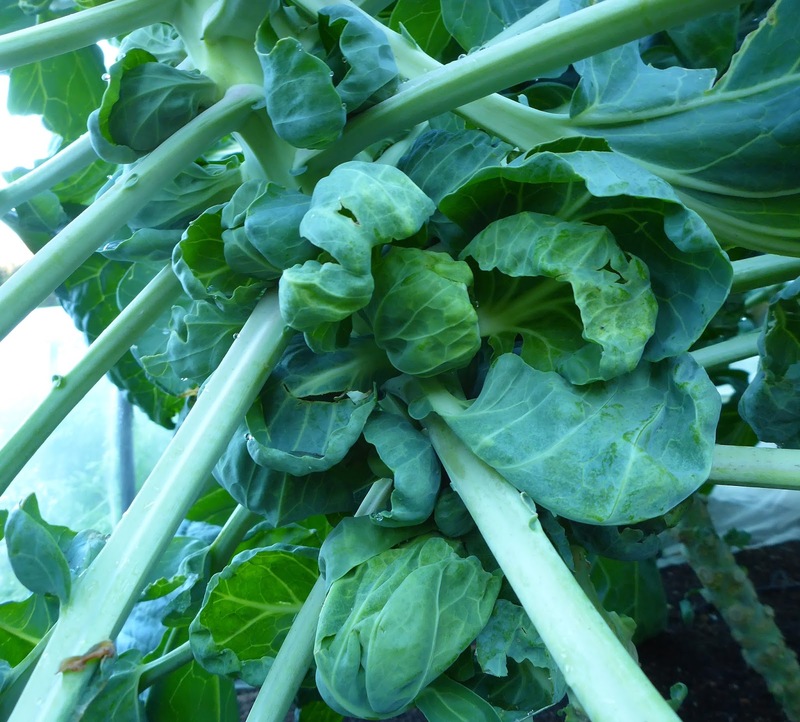 The Hestia Brussels Sprouts are still producing blowsy sprouts, one plant in particular. Perhaps I'll cut some off and see if they taste ok and if they don't I'll pull the plants out. That's the latest in the garden. Thanks for stopping by. I skipped Harvest Monday last week because I was too tired Sunday night after an overnight backpack trip to put the post together and then too busy Monday morning. So here's two weeks of veggies, starting with a parade of tomatoes. 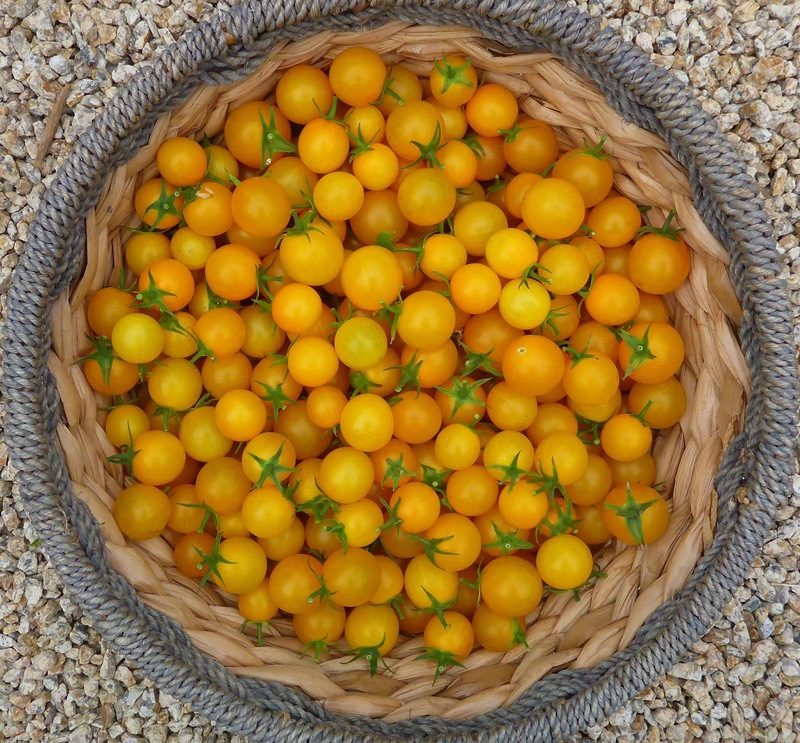 That's not a duplicate photo of the first basket of Sweet Gold cherry tomatoes, it's another basketful, my one plant has been terrifically productive. That one plant has produced 29.5 pounds of tomatoes so far which makes it the single most productive tomato variety in the garden this year. The parade started to thin out last week, most of the large and medium sized tomatoes are about done and the cherry tomatoes are slowing down. This year I decided to dehydrate a lot of the tomatoes. 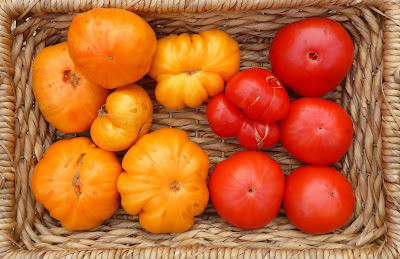 That actually turned out to be the best use for the Pomme d'Amour tomatoes which I found to be not very tasty raw, but the flavor improved a lot when I dried them. And I continued my experiments with drying the Sweet Gold tomatoes with a salted spice blend. A mixture of fennel, smoked sweet onion, smoked peppers, and Red Boat salt has become the favorite. They were a really nice treat on the trail so I plan on making more. 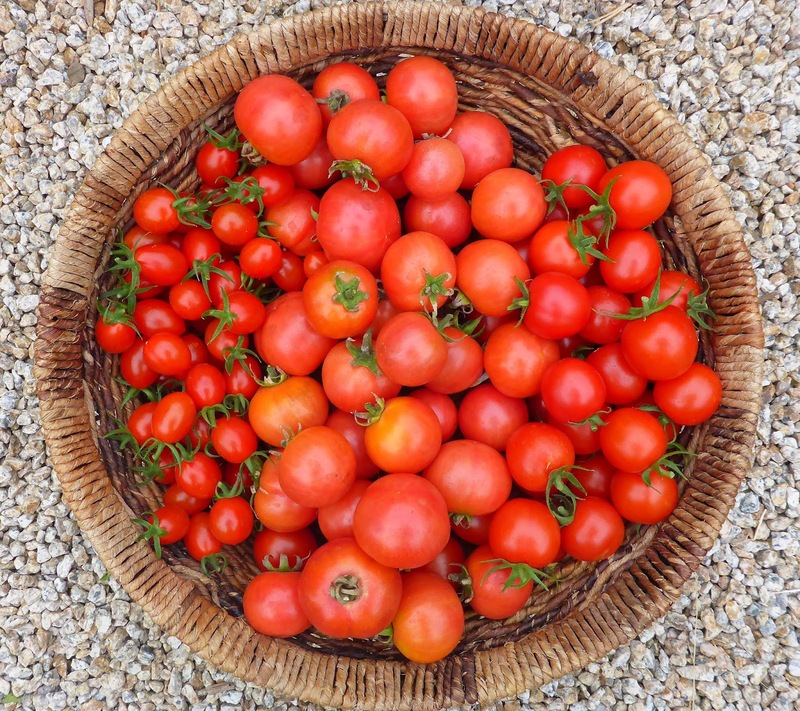 I combined the bulk of the Reisetomate tomatoes and a number of Pantano tomatoes to produce 4 cups of tomato paste which is probably enough to see me through the year. And I really like the flavor of tomato sauces made with the Mavritanskite tomatoes so I turned a bunch of them into sauce. 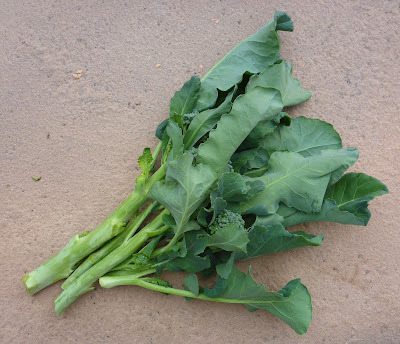 The Calabrese broccoli is only putting out a few shoots here and there. 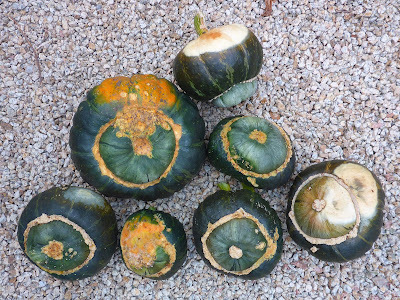 I had to harvest a number of the Discus Buttercup squash because of damage from sunburn and/or sowbugs. And then I found that the sowbugs were starting in on the Candystick Dessert Delicata squash that were in contact with the soil so I harvested a couple of those also (not photographed). 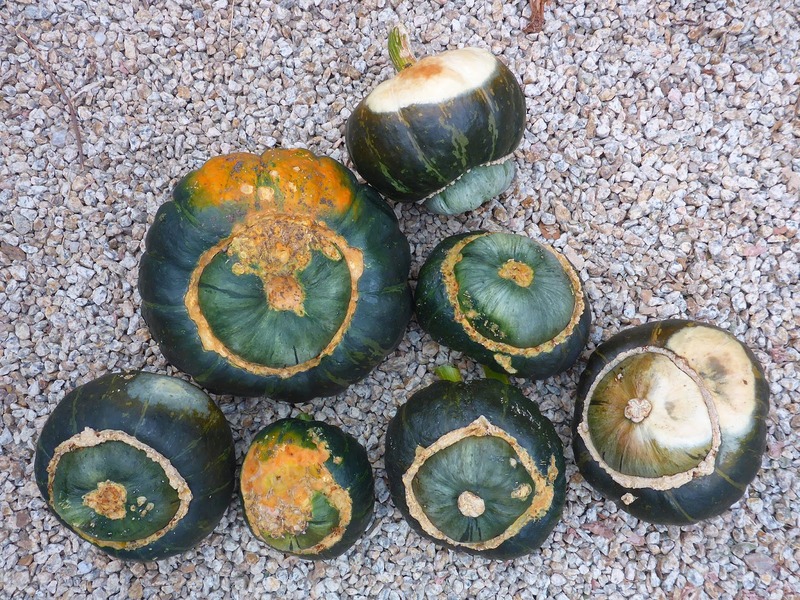 The Tromba d'Albenga squash had a big flush of fruits. I used the bulb ends to make baked rice stuffed squash, no recipe, I just winged it and they came out delicious. The long solid necks got turned into Zucchini Sott'Olio. The Bonica and Sicilian eggplants eked out a few fruits. I used the Bonica to make a batch of caponata, which also used up some celery, capers, tomatoes, and onions from the garden. 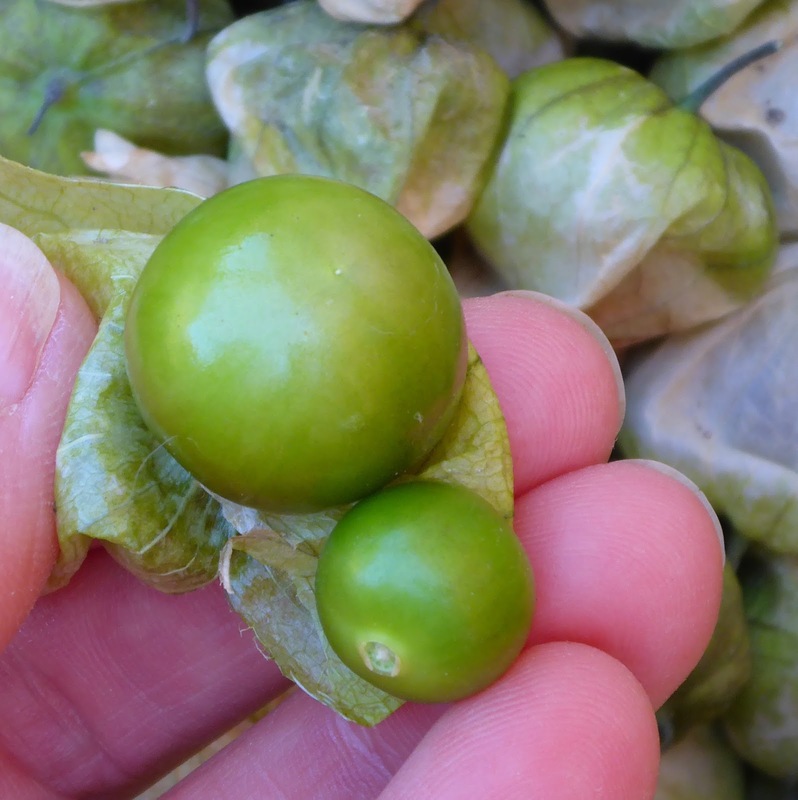 I cut down the Zuni tomatillo plants the other day. They were severely infected with powdery mildew and had to go. 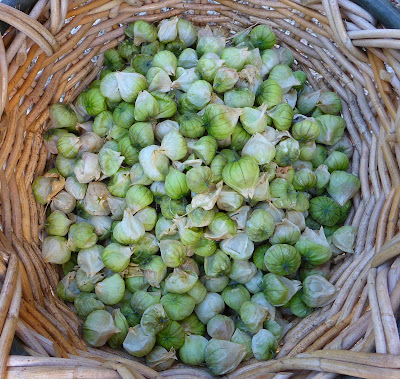 I was somewhat inclined to toss the plants complete with the tiny tomatillos but relented when it became clear that there was quite a load of them, 5.5 pounds in the husks. 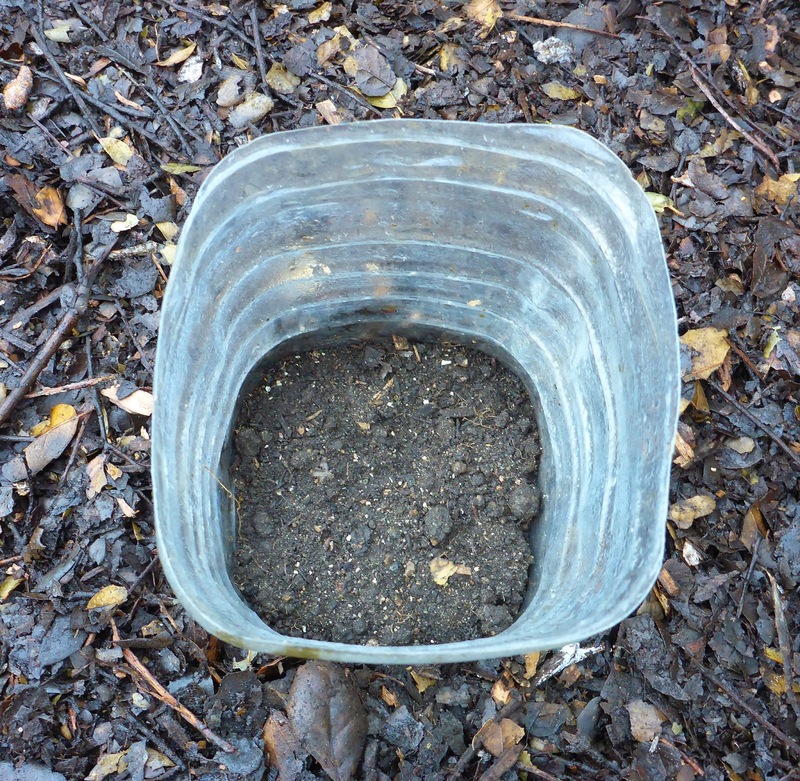 They are fairly easy to remove from the husks, otherwise they might indeed have gone into the compost. 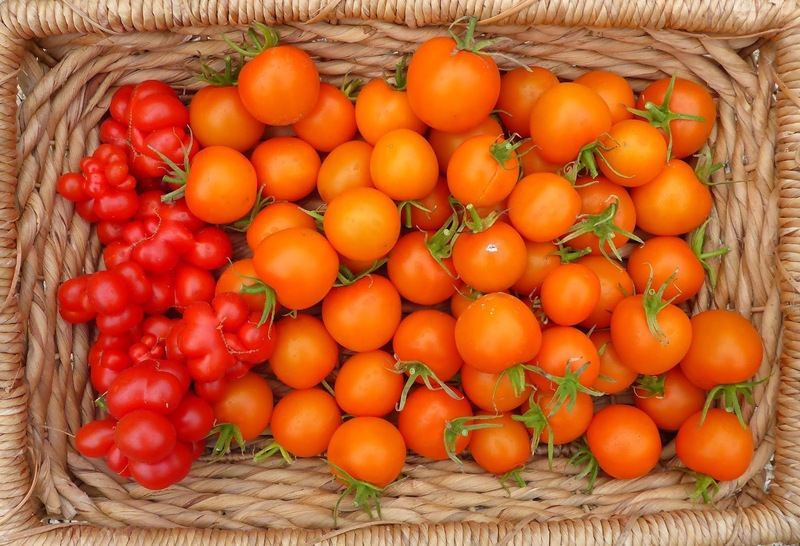 There are a lot of fruits that are barely the size of a large pea, more that are about the size of a grape, a just a few larger ones. 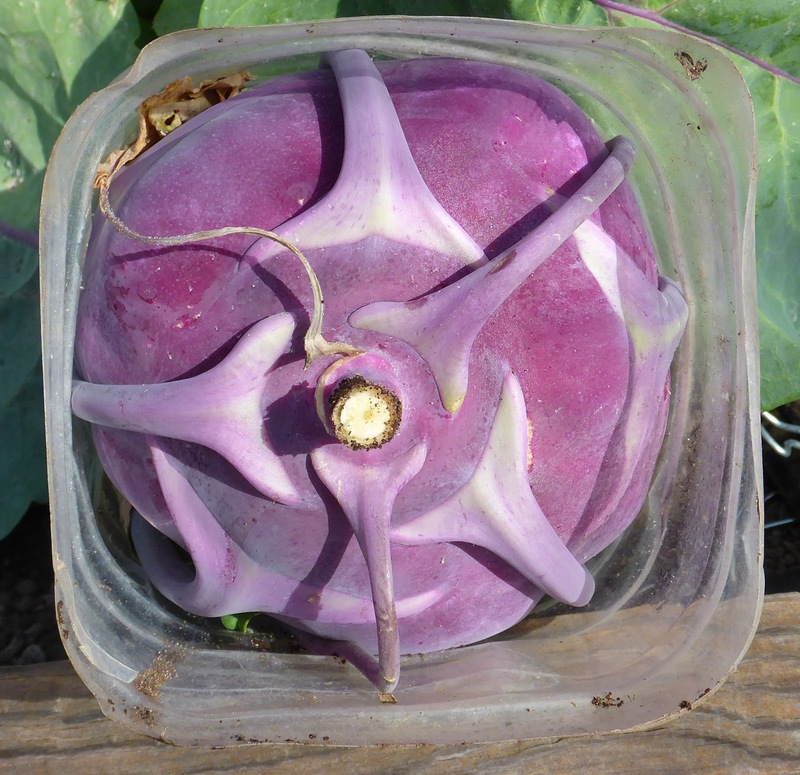 If I had waited any longer to harvest the kohlrabi I would have had to cut the protective sleeves off of them. I thinned out the Jericho Romaine lettuce to give the main planting room to size up. 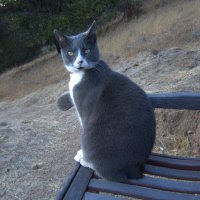 Good news to report on the Soberanes fire. On October 12, day 83, it was declared 100% contained. The bad news now is that we've had some significant rainfall. Rain is bad for the fire? Yes, when there's too much. Just enough would extinguish remaining hot spots and nurture new plant growth, but too much causes erosion, landslides, mud flows, and flooding. The crews that are working on suppression repair can't work when it rains. On Sunday my phone buzzed with an emergency alert that turned out to be a flash flood warning. I'm ok where I sit but Tassajara was included in the area affected by the warning, along with a number of other communities in or near the burn scar. They escaped the fire but now they are in danger of being flooded. What a mess. I haven't heard any news of floods or problems this morning and the rain is clearing so they escaped the bullet for now. 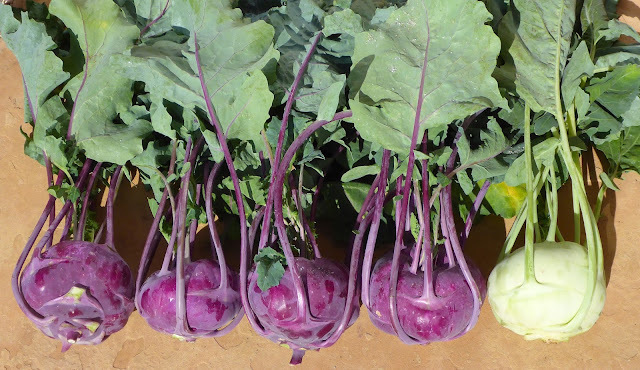 Other harvests that I didn't photograph included a few and probably the last cucumbers, Mouse Melons, some peppers that got cleared out of the garden awhile ago, and the Zebrune shallots that have been sitting in a basket waiting to be weighed. I ended up dehydrating a lot of the peppers I grew this year. 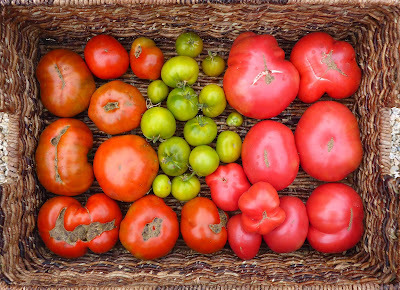 Most of them were harvested (rescued from the rats) underripe and not as sweet and flavorful as they can be. Dehydrating improves the flavor quite a bit. A lot of the peppers did not get tallied since I lost track of what did or did not get weighed in after they were harvested. Calabrese broccoli - 6.9 oz. Green Fingers cucumbers - 3.6 oz. Mouse Melons - 8.8 oz. Bonica eggplant - 1.6 lb. Sicilian eggplant - 8.7 oz. 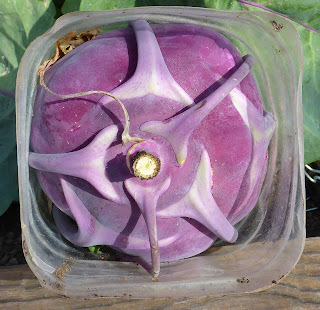 Kolibri kohlrabi - 6.8 lb. Kongo kohlravi - 1.9 lb. Jericho Romaine lettuce - 4.7 oz. Craig's Grande Jalapeno peppers - 16.2 oz. IPK P 557 (Italy) peppers (Yellow Bell) - 2.6 lb. Rosso Dolce da Appendere peppers - 8.3 oz. Zebrune shallots - 23.7 lb. 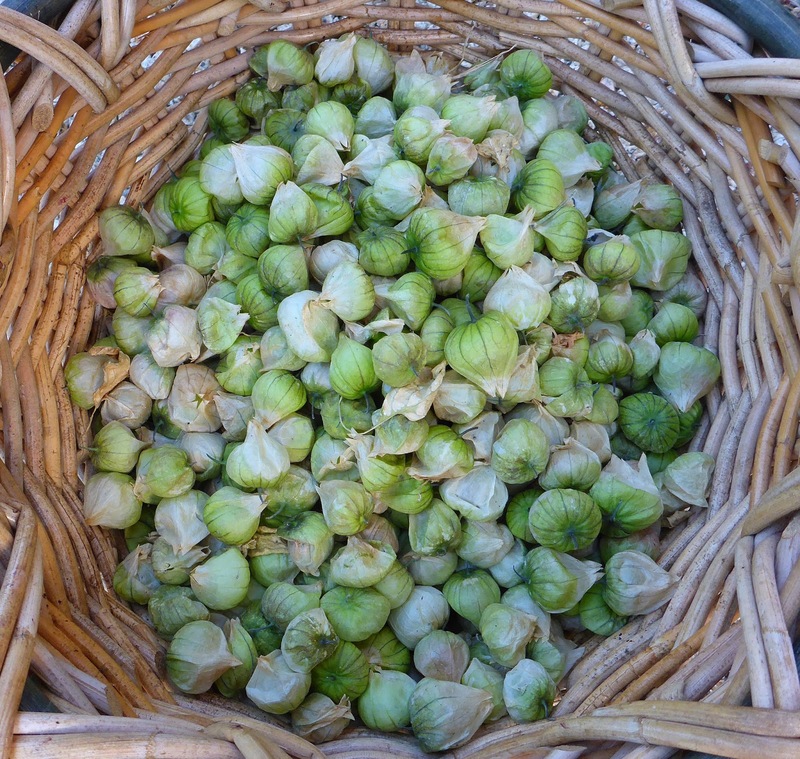 Zuni tomatillos - 5.5 lb. 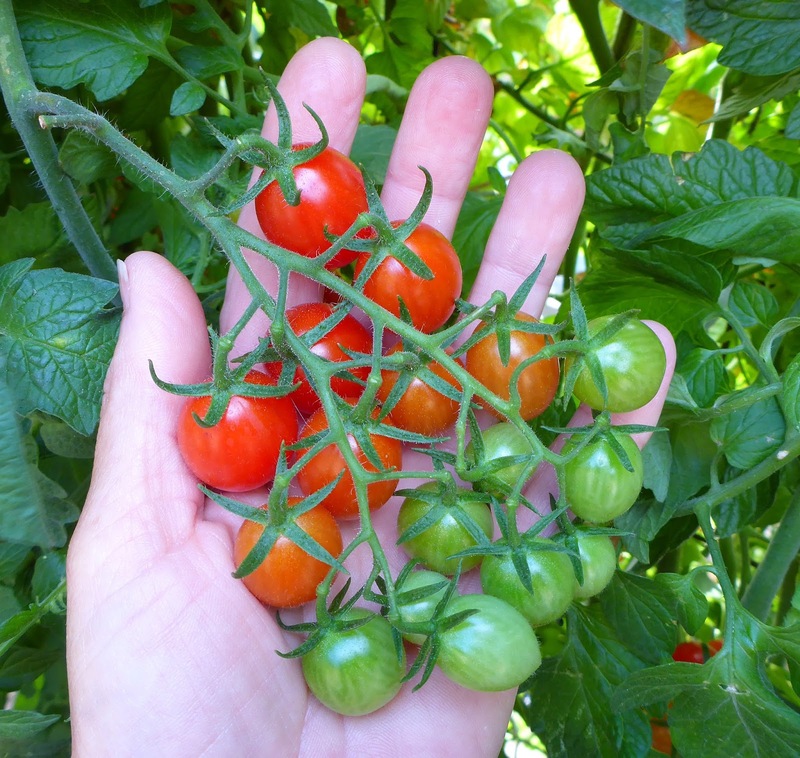 Camp Joy cherry tomatoes - 5.5 lb. Chianti Rose tomatoes - 9 lb. Jaune Flamme tomatoes - 5.6 lb. Lime Green Salad tomatoes - 1.3 lb. Mavritanskite tomatoes - 9.1 lb. Orange Jazz tomatoes - 9.6 lb. 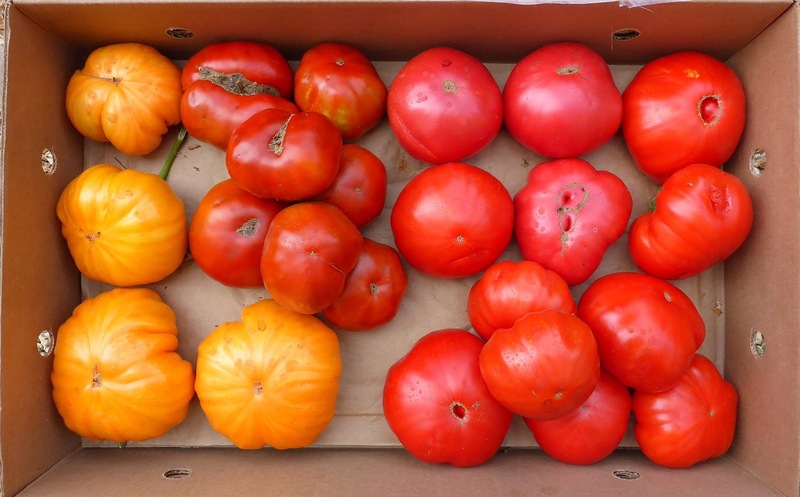 Pantano tomatoes - 12.8 lb. Piccolo Dattero cherry tomatoes - 3.5 lb. 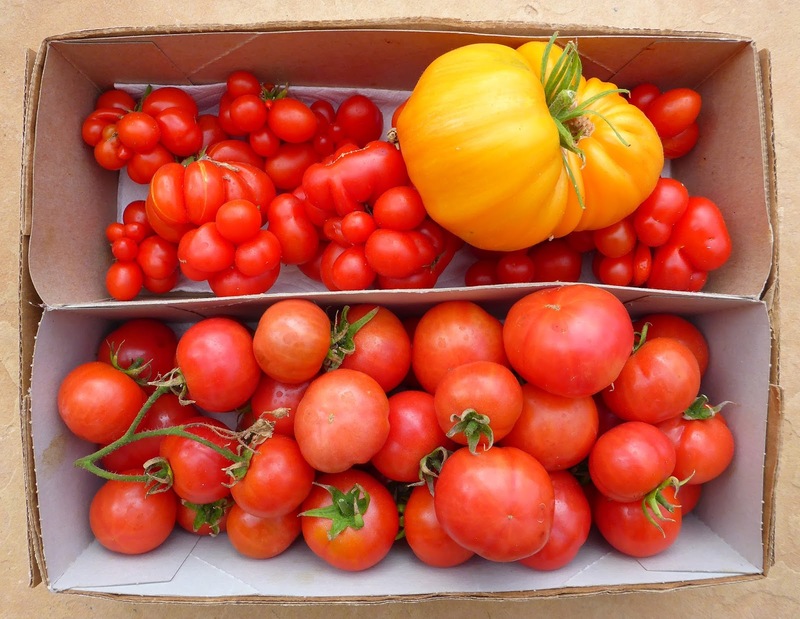 Pomme d'Amour tomatoes - 3.4 lb. Reisetomate from Transylvania tomatoes - 1.4 lb. 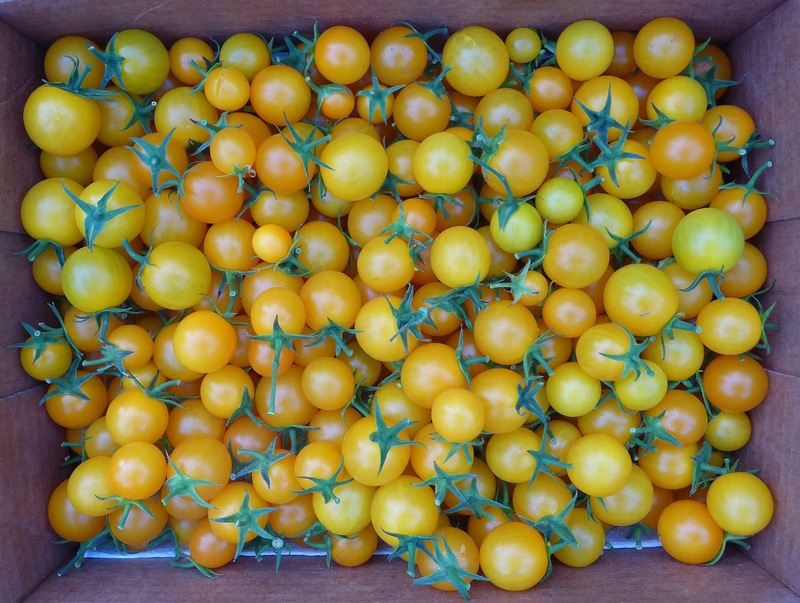 Sweet Gold cherry tomatoes - 12.2 lb. Romanesco zucchini - 2.4 lb. Tromba d'Albenga squash - 9.1 lb.